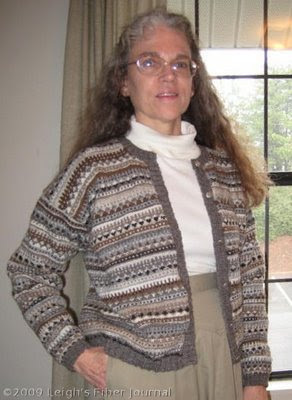 Leigh's Fiber Journal: Shetland Sampler Cardigan Complete! I'm delighted to announce that at long last it's done! I had hoped to get out of modeling it myself as requested, but unfortunately, Sue suggested a tripod, which unfortunately I have. It's the best fitting sweater I've ever made for myself. Cathy, who donated a lot of fleece, both locally obtained and from Riverbend Farm. Tina, who donated some of her own. Sharon, who did the same. Mim, from whom I got a sample via Sharon! Yarn - 2-ply handspun measuring 16- 18 WPI. 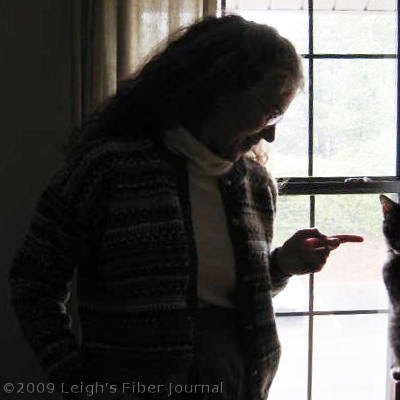 Photos of all 20 can be seen at this page of my Fiber Gallery. If you click the links under the photos, they will take you to blog posts with photos of the raw fleece and spinning details for most. Sweater Pattern - Measurements were copied from my Rare Breed Sweater, with an adjustment made for the neckline. Though technically not true Fair Isle knitting, I did use a Fair Isle Stitch Pattern. Stitch Design - From Anne Field's "Dyepot Fairisle Sweater," The Ashford Book of Spinning, pages 98 - 99. This required calculating yarn amounts for the color rows, details on how I did that here. I started the spinning for this project in June 2007. Swatching started in January 2008. I took my time and did not do any knitting during the heat of summer. I also set it aside at times to ponder various things I needed to figure out or calculate. Does it seem like it took that long? I can't tell. I lose track of time with a project like this. But I've learned a lot and I'm very happy with the outcome. Your sweater is fantastic! Is Catzee as impressed as she looks? I know I am impressed. Greatly impressed. Wow, great job, it's just lovely. Leigh, it's absolutely stunning! It definitely looks as though it deserves the work and thought put into it. This is absolutely amazing, and which enormous job it must have been! It's just beautiful and it looks like it fits perfectly. Ah yes, only half a cat. Such is the joy of trying to photograph oneself with a timer and a tripod. She was a volunteer cat after all. Actually her interest was more along the lines of "what in the world are you doing while I'm trying to look out the window," rather than the sweater itself. Unless of course I leave it laying around somewhere. Then it immediately gets claimed as a cozy kitty bed. It has been such fun watching the sweater evolve! What a nice nice sweater. I know you will enjoy years of wear. I liked this project of yours for so many reasons...thank you for posting about the process and the techniques! don't know why you're complaining about being the model - it fits perfectly and suits you really well! I think it's worth every minute you spend on it - doesn't it give you great satisfaction to make something that well? I think you should be proud of yourself!! Everything is perfect, fit, color model! Beautiful work! I didn't relize I had a hand in this sweater. Cool! Thank you Sue for suggesting the tripod!! 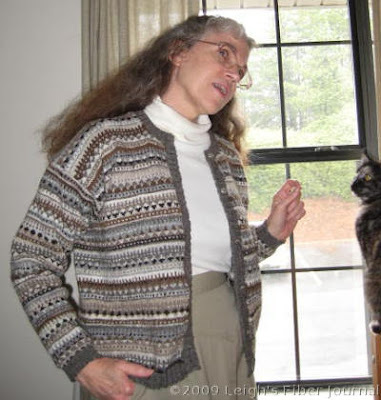 The sweater is wonderful - so nice to see it being worn and to know some of the fleece that went into it. And give that kitty a pat - obviously someone(s) had to keep you in line. So fun to finally get to see it finished and on you! It's very beautiful and it looks so good on you. Congratulations! your sweater is beautiful and it looks comfortable too. as always, thank you so much for sharing your work with us. The sweater is beautiful and it looks wonderful on you. Congratulations on such a super successful project! Wow - it is gorgeous!!! It looks great on you, and great with khakis. Although, one of my spinning friends says that she thinks spinning lets her get more of her money's worth from fiber because she gets that much more enjoyment out of a project. Gorgeous!! Thanks for getting out the tripod!! No one could look as nice as you do in your sweater. Worth every minute you put into it. Beautiful!!! Not only is it a beautiful sweater and a good fit, it really suits you too. Many congratulations. Is it Catzee who's peeking in there? I can't decide, I think Rascal may be a bit bigger? My old cat Oscar always used to stick his head in front of the camera, don't know why but if he saw me with the camera he run up and peer into it!! Simply beautiful! If you enter it in any contests, (like Maryland Sheep and Wool Festival, hint-hint,) I don't see how it could take anything but top prize. It is truly outstanding. Congrats! Absolutely gorgeous intricate sweater- good job! Lovely! Congratulations on a job well done! I drove home after work to Robbie chasing/menacing Mickey. Someone needs to shear them!!! Mickey is in the sweater - not Robbie. I sent you the right karmic wool - I see that. This is a beautiful, timeless sweater! Kudos! Thank you all for your kind comments! Woolly Bits, I'm like Annie, for some reason I hate modeling for my blog. I hate having my photo taken actually. I'm definitely a behind the scenes type of person. Dorothy, you're correct, that's Catzee. And you're also correct about Rascal. He's much larger, about double her weight in fact. It's funny you should mention Oscar's habit though, because Rascal is the exact same way! Maybe it has something to do with being a black cat? Textillian, it never occurred to me to enter this anywhere. Doubt I could part with it though. I appreciate the comment however. This is a most lovely cardigan. An heirloom as well as so wearable. I have unexpectedly found 3 unwashed fleeces in the attic and I am spending hours washing and spinning. I will be reading all your related posts on spinning and dying as I am a novice.Your post comes at just the right time for me. A really impressive sweater. I'm so glad circumstances "forced" you to model it yourself. It fits wonderfully. It's just gorgeous! I'm honored to be a part of it. (and the model is gorgeous too, don't ya think?) :-) T.
Leigh, WOW!! And I'm glad you modelled it - it's nice to see a photo of you! And as you say, it fits you *very* well, so it would be a shame not to show that off. ;) A true master work, say I. Look at you, what a great sweater! I looks like it fits great and the color is perfect on you. Congratulations, what a triumph. I have followed this cardigan avidly from fleece to finish and I am so impressed - not only by your craft skills but by the way you apply them so thoughtfully to the materials. Wear it and bask! At least until the cat moves in. Don't they have an unerring instinct for the best quality beds? Wow! I'm drooling! What a wonderful work of art you've produced. May it bring you joy for many, many years to come. It looks wonderful! Congratulations on compleating such an amazing project! You rock! Finished at last. You can be very proud of your work. I admire your work. It is incredible and looks so wonderful on you! Your blog looks fabulous also! I can't wait to see more. Incredible! I love that you took your time to puzzle out answers, all that work and thought has definitely paid off!